Aug. 5-12, 2006 SOLD OUT! Aug. 12-19, 2006 Sign up now! Cost: Upper-deck cabins, *$1,295 per person; lower-deck cabins, $995 per person. Includes meals and drinks aboard ship. Mandatory group insurance, airfare, ports fees, transfers, gratuities are extra. 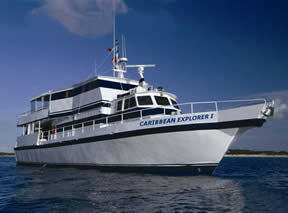 Where: 7 days aboard the M/V Caribbean Explorer I, exploring and diving the "out" islands of the Southern Bahamas. 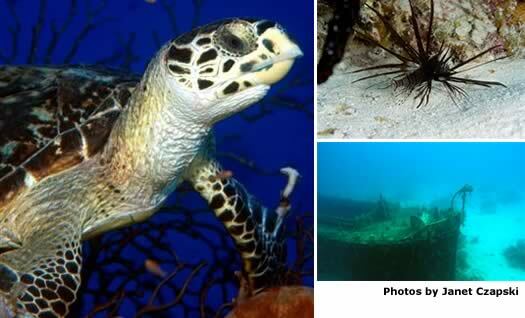 Diving: All diving is done from the mother-ship and features up to five dives a day. Nitrox ($150 value) is available free of charge for those carrying valid certification. Deposit: *$750 deposit required to confirm space. Final payment due by June 15, 2006. By popular demand, second trip added week of Aug. 12-19!! Come and join us aboard the M/V CARIBBEAN EXPLORER I, CEX I as she's fondly known, for a fabulous week in the "out" islands of the Bahamas featuring big-animal action and pristine walls and reefs of the Southern Bahamas, including (depending on the week and weather) San Salvador, Rum Cay, Conception Island, Cat Island, and Long Island. The CEXI carries 18 passengers in 9 cabins. The four upper deck cabins ($1295.00* per person) Feature large windows, private bath and shower and either double/twin or queen beds. The five lower deck cabins ($995.00* per person) are accessed from the main salon and each cabin has double/twin beds, private sink & vanity and share two full bathrooms. All cabins have ample under-bunk storage & small closet areas. She carries a crew of up to 8 members to take awesome care of you! 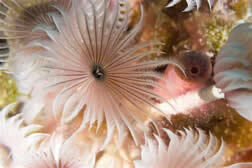 All diving is done from the mother-ship and features up to five dives a day. For our charter Nitrox ($150 value) is available free of charge for those carrying valid certification. Individual gear bins, multi-level camera table, charging station, rinse bins, freshwater showers and wide stairs to the dive platform with air & nitrox filling stations are part of the well-organized dive deck. The main salon area just fore of the dive deck provides the indoor dining salon & galley along with tv/vcr/dvd and cd stereo. The upper deck features a comfortable covered seating area just forward of the sundeck and bar-b-que area. Lunches and the weekly bar-b-que are served on the sundeck; breakfasts and dinners are served in the main salon. All meals, snacks, coffee, tea, sodas and alcoholic beverages are included in your charter price. Flights must be arranged into Georgetown, Grand Exuma and are not included in the charter price**. Also not included are Friday evening dinner, port fees (approx $75), fuel surcharges if applicable($100), items of a personal nature, gratuities to the crew and mandatory group trip insurance. Airport transfers are also additional as well as departure taxes if not part of your airline ticket. Cabin assignments will be made on a first-come, first-served basis. An initial deposit of $750.00 is required to confirm your space; final balance will be due by June 15, 2006. Passports and/or certified copies of birth certificates are REQUIRED***** for entry into the Bahamas. Visas are not required. The Bahamas does not require any inoculations. *PLEASE NOTE: All prices reflect a 3.5% discount for purchases made with cash/check. THERE ARE NO DISCOUNTS FOR SALES MADE ON CREDIT CARDS.